When I first saw this article on the 'G-line' transmission system, I thought the cone at each end of the line was just a gimmick to make it look high-tech. My ignorance of the way the system works was responsible. As it turns out, the 'G-line' transmission medium, named after inventor Dr. Georg Goubau, an engineer at the renowned U.S. Army Signal Corps Engineering Laboratories at Fort Monmouth, NJ, used the cone to transition a finite radius coaxial cable outer conductor to an infinite radius, sort of virtual, outer conductor that was free space. Doing so permitted a single line to do the job of carrying a signal from point A to point B. This significantly reduced the installation and maintenance cost of deploying a cable-based communications system - in this case for television broadcasts in areas where over-the-air- broadcasts were nearly impossible. G-line came with many of its own unique issues, and history shows that ultimately it was not a workable long-term solution. Fig. 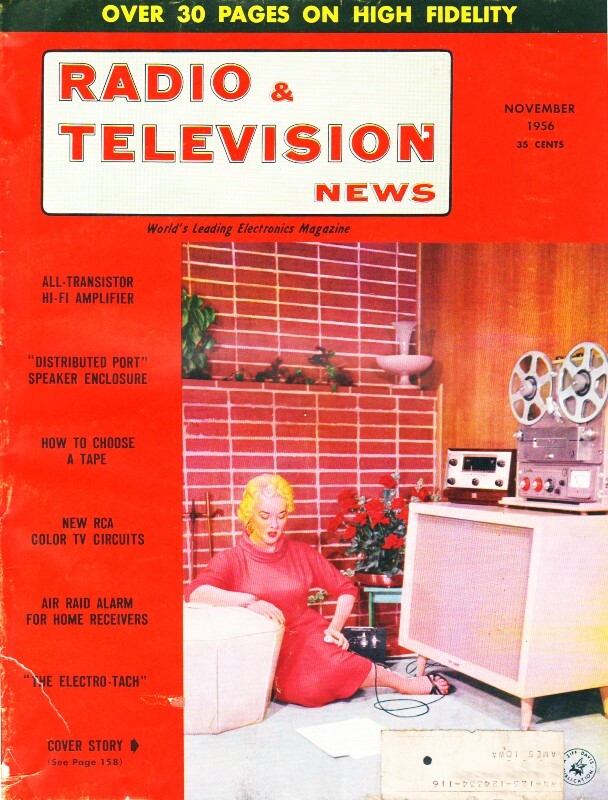 1 - TV reception by "radiation." One subscriber merely placed his Yagi near the "G-Line" and picks up good signals. The use of a novel transmission line has cut the cost of system installation and maintenance at Helena, Montana. The economics of most community TV installations dictate that the operator bring the TV signal from the antenna to the community before he can start collecting his installation fees. This means that the initial investment involves the cost of erecting the antenna and installing the transmission line and its associated amplifiers. Maintenance of the system is largely confined to the servicing of the amplifiers and this item is, therefore, a direct function of the distance between the antenna and the community. This article will describe a new method of bringing the signal to the community, a method which is far more efficient and economical than the conventional cable systems. Coaxial cable has an attenuation on the order of 20 db per 1000 feet on the lower TV channels. This means that for sound design at least two amplifiers are required per mile. In addition to the initial cost of the amplifiers and their maintenance, in many instances a special power cable must be strung to these amplifier sites. In some localities, therefore, consideration was given to a microwave relay to bring the TV signal from the mountain to the town. FCC regulations permit public utilities, like A. T. & T., to lease their microwave facilities to community TV systems but forbid the community operator installing his own microwave link. As a result, many community TV installations remain paper projects. Television reception is not possible in Helena, Montana, but only 15 miles away is McDonald Pass and the Continental Divide, and channel 13 can be picked up there from Missoula. By conventional coaxial cable methods the 15-mile haul would cost $40,000 to $50,000 just for the initial installation. Helena was fortunate in having Bruce Hamilton, an alert engineer, in charge of its community TV project. He had read about the "G-Line" and realized that this technique might solve Helena's transmission problem. 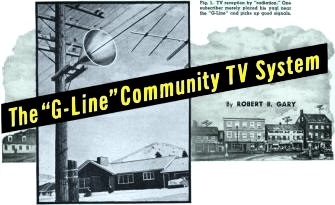 After some study and investigation, Mr. Hamilton started on the project of installing the first "G-Line" in a community TV system. Fig. 2. The "installation" of the "G-Line" consists. for the most part. 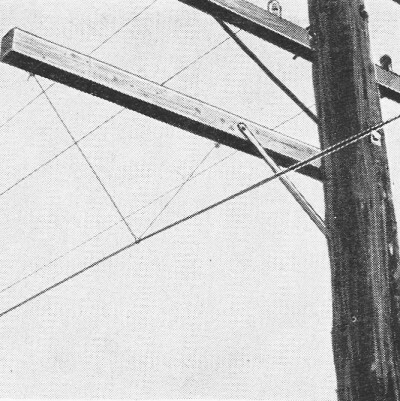 in suspending the line from the cross-arm of a utility pole by a quarter-inch nylon rope. Fig. 3. One of the "launchers" used in the Helena installation. Fig. 4. Nine horns and amplifiers cover the 15-mile stretch. The "G-Line" is named after its inventor, Dr. Georg Goubau, who developed this single-wire line for the U.S. Signal Corps. 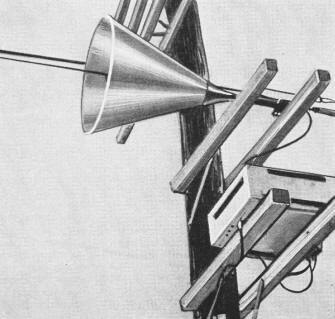 (Details on this line were given in Leonard Lieberman's article, "The G-Line Antenna Lead-In," in the April 1955 issue of this magazine). Fundamentally, the characteristics of this line are those of a coaxial cable of fixed dielectric except that the outer conductor is placed at infinity. By choosing the proper relationship between the inner conductor and the surrounding dielectric diameter, the mode of wave propagation is largely axial. It is only necessary that the single-wire line be fed from a coaxial system by means of a carefully designed "launcher." This is, effectively, a cone with the center conductor at its apex and the outer conductor making the transition from the coaxial cable to the infinite spacing. Fig. 3 shows a typical "launcher" as used in the Helena installation. The "G-Line" has some remarkable properties. Its losses at the lower TV channels are on the order of 10 to 20 db per mile depending on the particular installation. The installation of the single-wire line is slightly tricky. When the line is about a half wavelength from the pole or other object, the loss at that point will be 0.05 db. Losses due to bends in the line become appreciable as the corner is made sharper. Theoretically, the db losses vary with the square of the bending angle and whenever bends are required they must be as gradual as possible. Another important characteristic of "G-Line" is that, theoretically, there is very little radiation. In actual practice Mr. Hamilton found that the radiation from the single-wire line was a maximum of 1.5 microvolts-per-meter at a distance of ten feet and this was at a point of greatest signal energy level. This factor is confirmed by the photograph of Fig. 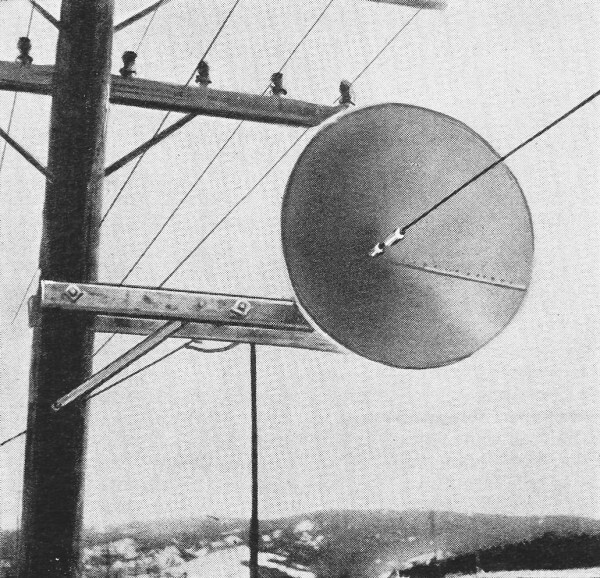 1, which shows a rather unique method of tapping off a TV line: A home owner along the route of the "G-Line" simply placed his yagi antenna close to the wire and got good TV reception. This method "has the operator's sanction since the regular rental fee is paid by this "radiation subscriber." The channel 13 signal from Missoula is received by a conventional antenna array and amplified before it is converted down to channel 4. This conversion was suggested by the poor performance of the channel 13 strip amplifiers which were tried first. The "G-Line" itself is more efficient at the higher frequencies but the amplifier considerations outweighed this feature. For channel 4 transmission, the maximum diameter of the "launcher" is 58 inches with a taper angle of 45 degrees. The inner conductor of the "G-Line" is #8 Copperweld and the dielectric is brown pigmented polyethylene with an outer diameter of 0.253 inch. Although the theoretical distance from foreign bodies should be on the order of half a wavelength, for practical reasons the wire was suspended about 15 inches below the lowest cross-arm of the telephone poles belonging to the Mountain States Telephone trunk line. In most straight sections the line is suspended by 1/4-inch nylon rope as shown in Fig. 2. At some bends 15-inch polystyrene rods are used to brace the line horizontally. The telephone poles from McDonald Pass (altitude 6000 feet) to Helena (3000 feet) predate the road and therefore run along the road at only a few points. Distances between poles vary and the line crosses the new U.S. Highway 10 several times. Because power is not readily available at all points along the line, the line amplifiers are located at unequal intervals and the longest stretch of "G-line" is about 2.5 miles between amplifiers. On that stretch the total losses over 2.5 miles are only 53 db. A total of nine line amplifiers is required to cover the 15-mile stretch. Mr. Hamilton found it necessary to space the receiving and transmitting launchers about 120-feet apart at the amplifier stations in order to avoid ghosts caused by feedback. Recent Signal Corps tests seem to indicate that "launchers" can be placed back-to-back without appreciable separation and it may well be that some mismatch exists in the Helena system which causes this feedback problem. A typical horn and associated amplifier are shown in Fig. 4, and it is clearly apparent that the output of the "launcher" apex goes through the RG-11/U to the conventional line amplifier. In Helena, the signal is distributed to over 500 homes by means of RG-11/U, double-shielded coaxial cable and conventional distribution amplifiers. A total of 70 miles of RG-11/U has been used to date in Helena just to hook up subscribers to the distribution amplifiers. The installation fee is $125.00 with a monthly tariff of $3.75. The major initial investment, as in all community TV projects, was the cost of bringing the signal down from McDonald Pass. While conventional coaxial cable and amplifiers would have cost at least $40,000, the actual cost of installing the 15 miles of "G-Line," including the price of the wire itself, the amplifiers, antennas, power connections, etc., was only slightly over $12,000. The weather conditions at the Continental Divide are probably the most severe, with regards to snow and ice, in the country. During the past winter, however, the signal was lost for only half an hour when an inch of wet snow accumulated on large portions of the line. As soon as the snow had melted or fallen off, the signal was restored. Since there is no outer conductor, the problem of moisture seeping in or condensing between the outer conductor and the dielectric does not exist. The outer polyethylene jacket has, in other applications, proven to be almost impervious to weathering for a considerable time. Helena TV Inc., the operator of this pioneer "G-Line" community TV system, is licensed by Surface Conduction Inc. of 521 Fifth Avenue, New York, the company which holds all commercial rights to Dr. Goubau's patents. So successful is the Helena installation that its owners are now intent on tackling a 27-mile line in the area. Other community TV systems which are planning to use the "G-Line" include the Neighborhood TV Corp. of Owen Sound, Ontario. Here the TV signal will be received at a suitable high point as close to Toronto (150 miles away) as possible and then transmitted to Owen Sound along the telegraph poles of the Canadian Pacific Railroad. 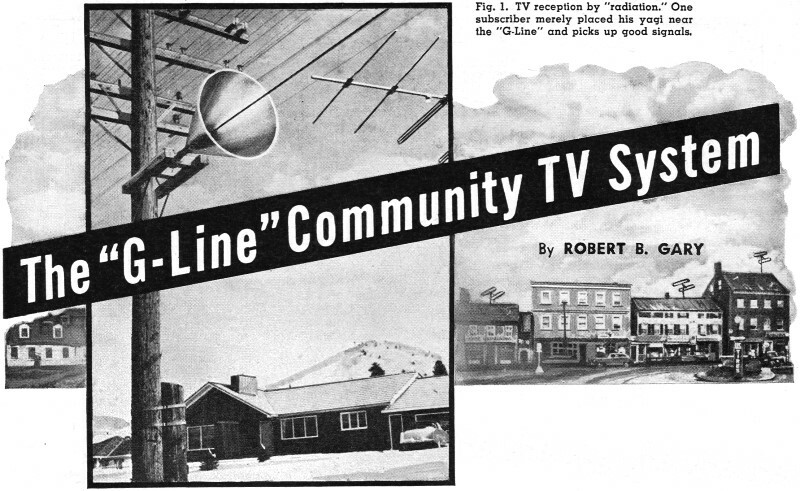 The most recent application of the "G-Line" to community TV was in September 1956 when an "open wire" transmission line was replaced by a single wire "G-Line" extending over 8000 feet in the Port Jervis community TV system. Port Video Corporation, owners of this system, found that this changeover resulted in improved performance. This new "G-Line" installation extends (apart from poles belonging to General Telephone and Rockland Light and Power), over system-owned poles separated by 600 feet or more, thus showing the adaptability of the line to varied local conditions.